Dateline Bangkok: Yingluck: "Someone points a gun at my head..."
a gun at my head..."
The Bangkok Post has performed a remarkable act of self-censorship, by printing and subsequently retracting an interview with former Prime Minister Yingluck Shinawatra. The interview appeared in yesterday's print edition, headlined "Yingluck saw the coup coming" and written by Wassana Nanuam; it was a major scoop, billed as Yingluck's "first public interview since she was ousted", yet it appeared on page three rather than page one. A Yingluck interview is remarkable in itself, as she is prohibited by the NCPO from commenting on politics. (Contrary to claims by an army spokesman, Yingluck and other political leaders were detained by the military after the coup, and released after agreeing to refrain from political activity.) Her comments in the interview are particularly unexpected, given the ban on criticism of the coup imposed under martial law. Most provocatively, Yingluck said that she felt as if she were being metaphorically held at gunpoint by the military: "I did my best to fulfil my duty as a prime minister installed via an election and who preserved democracy... It's the same as if the people had handed me the car keys and said I must drive and lead the country. Then suddenly, someone points a gun at my head and tells me to get out of the car while I'm at the wheel driving the people forward." The article focused entirely on politics, and prominently stated several times that Yingluck may seek re-election in the future: "Ex-premier mulls returning to politics... she has designs on a parliamentary run in 2016... Yingluck said that if in 2016 there is a general election and she is still qualified to stand, she intends to run for parliament." 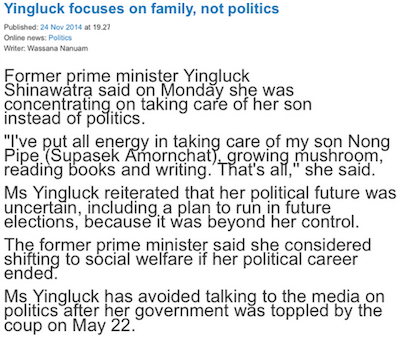 There were only three non-political sentences, giving a rather twee account of Yingluck's daily routine: "Whiling away the time, she now cultivates mushrooms in her garden..."
It was an explosive interview, though yesterday evening the Bangkok Post deleted it from its website and replaced it with a completely rewritten version, headlined "Yingluck focuses on family, not politics". The revised version's emphasis is entirely on Yingluck's private life, with no political content, making it the exact opposite of the original. The revised article actually contradicts the original interview, claiming that Yingluck has not decided whether to seek re-election: "Yingluck reiterated that her political future was uncertain, including a plan to run in future elections". Indeed, after the original interview appeared yesterday, Yingluck issued a statement denying that she plans a comeback. 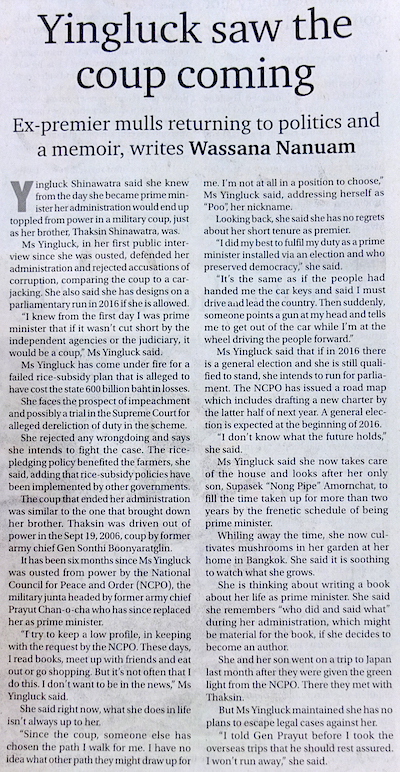 The Bangkok Post reported her denial today, headlined "Yingluck denies plan to seek re-election", though it made no mention of yesterday's interview which repeatedly stated precisely the opposite. It's highly unusual for a newspaper to publish such a newsworthy interview and then remove every quote from it, make it six times shorter (only 104 words, compared to 673 words in the original), and rewrite it with an anodyne and contradictory spin. The original publication also raises questions about the writer's motivations, as Wassana sometimes acts as a military mouthpiece and she is certainly experienced enough to know the difference between on- and off-the-record conversations.